The sleek San Francisco office of tech startup LaunchPodium is a big step up for two of its staffers. Tulio Cardozo, 32, and Caleb Hunter, 35, were inmates at California's infamous San Quentin State Prison. But today, their lives are similar to 20-somethings across Silicon Valley: They're trying to build a startup. LaunchPodium, founded in the spring of 2013, is an online marketing firm helping small businesses build websites, social engagement and advertising. The two men make up half the new company's full-time workforce: Cardozo is a lead developer, while Hunter is a technology architect. "LaunchPodium's main focus is about simplifying an entrepreneur's life," Cardozo said. "Think of it as an entrepreneur support package in a box." They pull all-nighters, weigh Wordpress versus Drupal, and spend their days white-boarding ideas. But only a short time ago, they wore matching blue uniforms and had access to nothing more advanced than a prison typewriter. Cardozo served just under six years in prison for manufacture of a controlled substance and was released in October 2011. Hunter served eight years for carjacking and vehicle theft and was released in October 2013. LaunchPodium founder Mike Parsons met the two men through a six-month prison entrepreneurship program called The Last Mile, founded by Chris Redlitz. Inmates create tech-oriented business plans and learn about the industry from guest lecturers and books by prominent entrepreneurs, like Guy Kawasaki's "Enchantment." They finish with a "demo day" where they pitch to actual Silicon Valley venture capitalists. 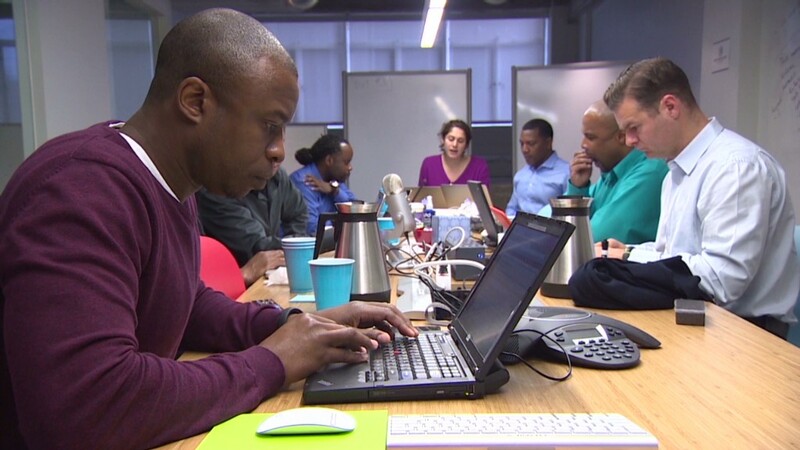 Parsons partners with the program, helping ex-convicts get acquainted with the tech world when they're released from prison. In addition to Hunter and Cardozo, he has five other newly released prisoners working as "entrepreneurs-in-residence" (meaning they work primarily on their own startups from the LaunchPodium offices). Hunter and Cardozo actually began their tenure at LaunchPodium three months ago as EIRs, where they perfected their technical skills. They were hired full time last month. "We made a very deliberate choice to go out there and work with people that really are just so committed to making a contribution," Parsons said. "Their advantage is in their attitude." The program is not just "do-gooderism" -- it's good business. Customers find the unusual backgrounds of the LP staff a compelling reason to work with them. "We bring a certain level of insight that perhaps someone who's [been] part of the everyday conversation wouldn't necessarily see," Hunter said. It's an unexpected benefit of their isolation, since much of the technology used today was developed while they were serving time. The smartest phone on the market when they were incarcerated was the Motorola Razer. Facebook (FB) still had "The" before its name. For both men, technology was at arm's length for years: Cardozo learned about Massive Open Online Courses while incarcerated, but to participate, he had to have his mother download course materials on computer science and mail him stacks of paper. "I always wanted to be a geek and go to MIT ... [but] I knew that wasn't gonna happen," Cardozo said. LaunchPodium has given the men a way to break into the tech world. "When they get in front of a computer or they see a smartphone for the first time, it's really a special moment," said Redlitz. "It's like a kid at Christmas or someone with a new toy." Back inside San Quentin, TLM is starting to select inmates for the program based on their potential for filling openings at its partner tech companies. It's a sort of in-prison job recruitment. After years of the concerns that cropped up on the cell block, the highs and lows of the startup world don't phase these guys. "We're sitting in a meeting, and it took me a moment to pause and realize, I'm literally living my dream," said Hunter. Correction: An earlier version of this story misspelled the name of LaunchPodium founder Mike Parsons.